Understand the energy used to transform raw material into finished product to enhance energy efficiency. The industrial sector accounts for about 34% of total U.S. energy consumption (1). This energy is consumed as electricity that is purchased or self-generated and as fossil fuels, such as natural gas, propane, fuel oils, and coal. Understanding these energy sources and their associated uses, equipment, efficiencies, costs, availabilities, and waste streams is critical to developing a sustainable energy-efficiency program. Every manufacturing plant has raw materials that come into the receiving dock and finished products that leave from the shipping dock. Between the receiving and shipping docks transformation occurs. Transformation adds value to the materials in a step-by-step process, and energy is required along the way. Evaluating the transformation steps and energy inputs provides clues about where to look for energy savings. Although transformation processes vary widely by industry, detailing them from dock to dock is essential to finding energy-efficiency opportunities. Energy audits typically examine facility support systems, such as compressed air, lights, and chillers, to find opportunities for energy savings. Manufacturing processes and the transformation steps that involve mixing, reacting, distilling, drying, and curing, however, are ripe with potential for savings as well. Understanding these processes and their associated equipment, technologies, and support systems is key to finding energy-efficient solutions. This article discusses energy efficiency, energy intensity, and transformation, and presents a ten-step method for conducting an industrial process energy analysis. The technique focuses on a process block diagram that shows energy inputs, energy wastes, energy recovery, and possible energy improvements. Some blocks may have multiple energy inputs, including electricity, natural gas, steam, and chilled water. Understanding the type and magnitude of these inputs helps to prioritize processes for energy improvements and can uncover new technology recommendations. Energy efficiency. The total energy into a system is Ein, which is the amount that appears on your utility bill. The total energy out of the system is Eout, which represents the useful energy that adds value to the product during the process. The difference between Ein and Eout is the loss. Loss is wasted energy that is not useful to the process and degrades efficiency. For energy efficiency to be sustainable, energy losses must be identified, documented, tracked, corrected, and prevented from recurring. If the loss were zero, the system would be 100% efficient — but this does not occur in the real world. A simple way to envision energy efficiency is to think about water flowing through a pipe — the water represents the energy and the pipe is the process. 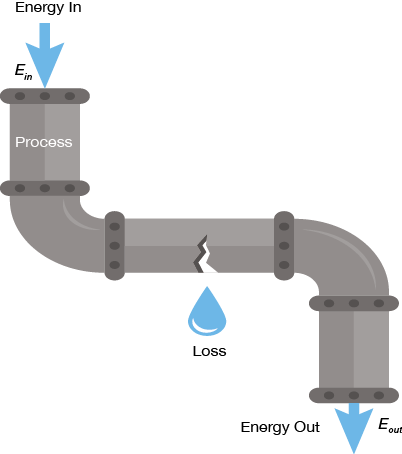 Ein would be the water into the system in gallons per minute (gpm), and a loss could be a leak in the pipe that reduces the amount of water available to add value to the product (Figure 1). ▲Figure 1. Consider the analogy of water flowing through a pipe — water represents the energy and the pipe represents the process. Any leaks in the pipe are akin to steam, heat, and other losses that degrade energy efficiency. Using the water pipe example, we can calculate energy efficiency. If Ein is 100 gpm and the loss due to leaks is 10 gpm, Eout is 90 gpm, and the energy efficiency of the system is 90% (Eout/Ein). While water leaking from a pipe is a useful visualization, a process heated by natural gas is more realistic. In this case, Ein is 1,000,000 Btu/hr of natural gas, and the fuel combustion loss is 100,000 Btu/hr, stack loss is 250,000 Btu/hr, stored heat loss is 75,000 Btu/hr, furnace wall loss is 50,000 Btu/hr, opening loss is 25,000 Btu/hr, and conveyor loss is 20,000 Btu/hr — for a total loss of 520,000 Btu/hr. Eout is the difference between Ein and the total loss, which is 480,000 Btu/hr, making the energy efficiency of the system 48%. Over half of the original natural gas energy input is lost and does not provide useful work in the process. Energy intensity. The energy intensity of a manufacturing process is the amount of energy that is required to produce one logical unit of product (e.g., kWh/ton metal melted at a foundry, MMBtu/bbl of oil refined at refinery, MMBtu/lb of polymer produced at a chemical plant). Energy intensity provides an order-of-magnitude estimate of the significance of energy in the production process, and it varies widely from industry to industry. Each step of the transformation process should add value with minimal waste. Every step requires some type and amount of energy to carry out the transformation. Certain steps require a large amount of energy, while others require very little. Outlining each step and the required energy inputs is useful for planning and prioritizing energy projects. 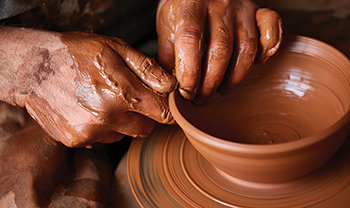 To understand transformation, consider the process that produces a vase from a lump of clay. Figure 2 depicts a step in the process with energy inputs from manual human labor and possibly an electric motor to turn the wheel. This step adds value by transforming the clay into a useful shape. Table 1 presents the details of this transformation. The steps that require a kiln are the obvious big energy users and would be logical candidates to evaluate for energy savings.